Here’s how it allows the Raptor to be like a Swiss Army Knife contained within an aluminum body. As the best selling vehicles in America, trucks already have to be able to wear many hats in the spans of their lives. They must be able to endure the weeklong commute efficiently and comfortably, extend their capacities when payloads are bulging, and even do some moderate off-roading when the going gets rough. A truck like the Ford F-150 Raptor, on the other hand, must be able to pull off all of these jobs and then go the extra mile. Famous drivers like Ken Block have shown us just what the truck can handle. However, Ford apparently wants us all to know it helps its drivers better ease between the multiple responsibilities the truck can handle using its specialized Terrain Management System. Put simply, this video is Ford’s way of highlighting just how impressive the hardware on the Raptor already is. 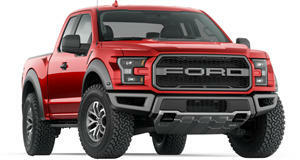 Unlike most pickup trucks, which have selectable four-wheel drive systems and even an auto setting to let the computer decide when to engage four-wheel drive in high or low range settings (or let two wheels do the lifting), the Raptor goes beyond that. That’s because it has to be able to do more than just tow or do some slow off-roading, it must also whip around the desert with the agility of an all-wheel drive rally car that constantly adjusts how much torque is going to the front or rear. In order to incorporate both an all-wheel drive torque distributor and a four-wheel drive transfer case, Ford uses a clutch-based system that it outlines here. Let’s be honest though, did we really need to be reminded why you want a Raptor?